(Updated with beautiful new image). 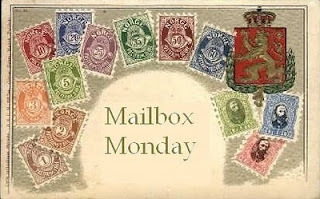 Thanks to all of our Mailbox Monday hosts! Created by Marcia at The Printed Page and on tour this month with Rose City Reader. A thank you as well to host Sheila at Book Journey! It's been a while since I took part in this meme, and I will blame it all on work! What a crazy start to 2011 already. The Oracle of Stamboul , by Michael David Lukas (Publication Date February 2011 - HarperCollins Publishers) - it arrives in a wonderful self-contained dark purple covering. So creative in how you have to open it and pull the book out! Exit the Actress, by Priya Parmar (Publication Date February 2011 - Simon & Schuster) - soooo excited to read this one! What about you? What wonderful selections came for you? I'd love to hear about it - feel free to post the link to your blog post, and if you don't have a blog, drop me a comment below and tell me what books you picked up, or are dying to get your hands on! That looks like you will be busy! Looks like some great reads there - some I am unfamiliar with and will have to check out. Enjoy! One Day is on my shelf - need to read it before the movie is out. What a lovely pile of shiny books! I'm sure you'll enjoy reading those. what a great stack of books you have there! I too have habit of a foreign sky and the first chapter is awesome! One Day is sitting on my shelves just waiting to be picked up - you have some I'm not familiar with....can't wait to hear all about them in your reviews! Great mailbox. Quite the collection! Exit the Actress sounds so good! Hope you enjoy those! Lovely! I'm especially interested to read One Day. I'm really looking forward to seeing what you think of One Day. It seems to be one of those Love It or Hate It books. Oooh, I see lots of great titles in there! The Other Life catches my eye. Nice stack of books this week. I'm going to be reading The Other Life in the next week or so. That one I'm excited about. 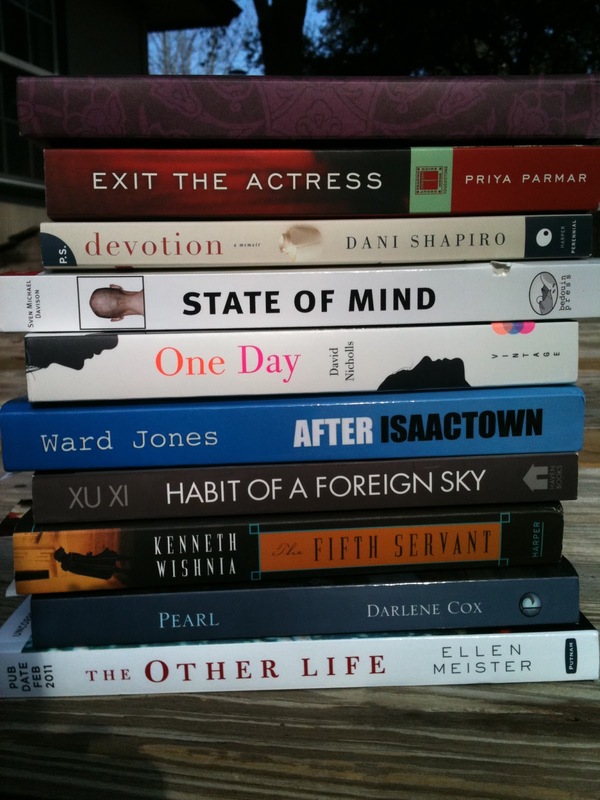 Great stack of books! I like when a book comes packaged in a unique way. Enjoy all those books! I just got The Other Life too, and I am quite excited about reading it. We will have to trade notes when we are done! I really loved One Day! I can't wait for you to pick it up. 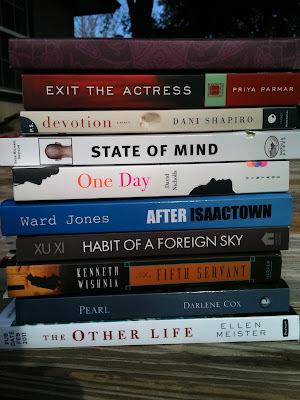 I received Exit the Actress in a giveaway, and it's going to be my next reading choice! Looking forward to it... enjoy! I really loved One Day. Just don't finish it in public. That's quite a stack of books you've got there! Looks like your reading year is getting off to a great start. Enjoy! As for me, I finally got from the snowed in PSU Libraries: Rebecca (a week late). And I borrowed from the Leisure Reading Collection: Christopher Buckley's Supreme Courtship -- and embarrassed myself tearing up with laughter reading the first chapter! What a great lot! I have After Isaactown for a blog tour - it looks like an interesting read. I also have The Other Life (which I'm totally looking forward to) and The Oracle of Stamboul is one that I definitely have my eye on. Enjoy them all! Looks like you got a lot of good ones there. I have One Fine Day and am really looking forward to it. Enjoy your loot! Your mailbox has been busy like mine. I can't seen to find as much time to read this month, so more audio books have been in use. Wow! You got some awesome books! Enjoy them! Oh my gosh so many good books! Great stack! I need to read One Day! What a nice little collection. The only one I read was "One Day" and I really really liked it! What a nice, varied haul! I'm midway through The Oracle of Stamboul right now and am curious to see where it goes. Enjoy your books! Wow, what a haul! I haven't bought any books this month, only received a Lonely Planet as a prize. I'm still reading my Christmas haul! I got After Isaactown a couple of weeks ago too, I am starting it today. It sounds interesting! Right now I am reading Cutting for Stone. It is so good! And after that I am jumping into the 2nd book in the Hunger Games series, Catching Fire. Can not wait for that. Yay, you did get Exit the Actress!!! Can't wait to see if you would like One Day. My daughter and I bonded over that one. I think she must have called me 5x while she was reading it. Enjoy all of those books! I received Devotion from TLC and look forward to reading that one too!